Alhamdulillah, I passed level 2. Yesterday was my graduation day and that's it!! I'm off for a week holiday in Korea then I will be going home - Malaysia for a week. Yeahh..can't wait to eat Nasi Lemak and Sate. Out of 14 students in my class, only 5 of them were able to proceed to level 3. Why? As I observed their proficiency, they speak Korean naturally; not forced and using as much daily Korean's phrases as possible. Tip 1: If you immerse yourself with Korean and Korean culture in your daily life, passing Level 2 in Sogang University is not an impossible task or I would say easier. Tip 2: If you want to skip level 1 and 2 in Sogang University and starts with Level 3 instead; I would suggest that you practise these critical grammars and be fluent in conversing them. If you can proficiently use them; you would have no problem to proceed with Level 3 because the same grammar will come out again and again but with difference nuance and context. So, it's important that you know the how and the difference. **among the above, the most important is 간접화법 - reported speech form as you will hear this used by Koreans again and again! Just watch your favorite Korean drama and you can't miss this. In Sogang University; your Korean speaking proficiency is highly regarded as the main portion to determine your ability to proceed to a higher level. Although Level 3 and above is the REAL challenge going forward but it is really important to get it right for the first time and gain a strong base of understanding on Korean grammar and Korean irregular grammar rules. Level 1 and Level 2 is THAT important!! Comparing Yonsei University, Ewha University and Hongik University of Level 2 - They are heavily saturated on grammar studies and focused on writing but has less speaking practice. I felt a bit intimidated initially when they knew greater pool of grammars but proud when I could speak better than them. In a nutshell, Sogang University's students are more edgy and forward to speak Korean. Although I had my "love and hate" days in Sogang University but I need all those to shape my Korean learning perspective and goals. Not only that, although I feel a bit disappointed with the teaching ability of my Sogang University's Korean teachers, I tried other means to gain better comprehension on the grammar usage and it's usage in context by attending other free Korean classes in Seoul. I received greater understanding of the nuance, made more Korean friends and met like-minded Korean language addicts in the process. 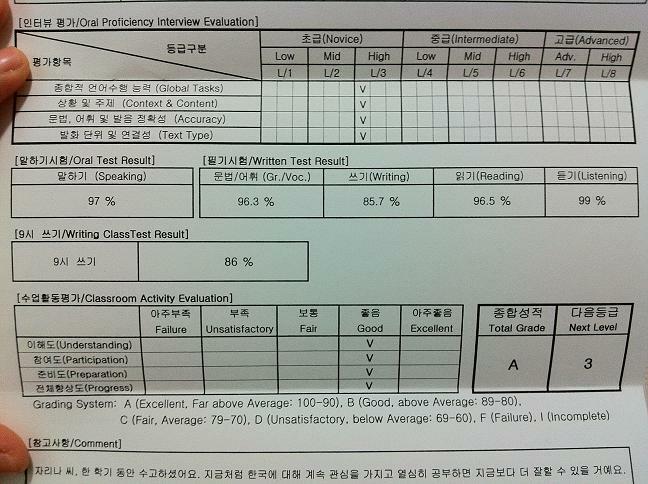 My Korean language journey so far has been marvellous!! Alhamdulillah..for this was not from my effort alone and my gratitude goes to my family who has been very supportive and to all of you who has prayed for my success. I would like to say thanks for those who has supported this blog and donated their hard earned money for my Korean learning education *you know who you are* and may Allah bless you for your good deeds. 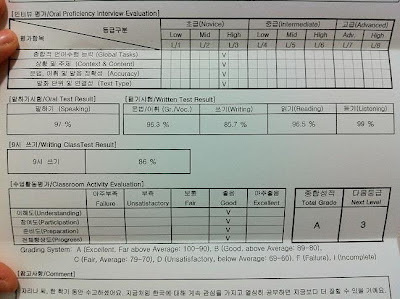 Here is my Sogang University's result - not to brag as I am still a toddler but for a source of motivation for those out there who sincerely wants to pursue learning Korean. for me to sit down and read as many Korean language resources possible. More photos at BudgetTravel2Korea Facebook.